A statement from F1's governing body the FIA said the man gained "unauthorised access" to the circuit. 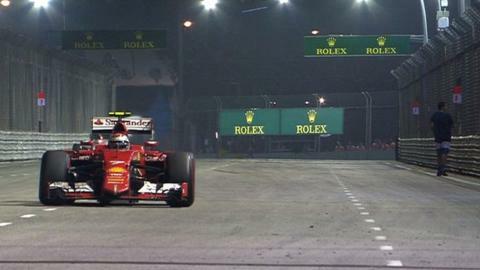 Vettel, who drives for Ferrari, made a joke about this incident, which has been reported to involve an English tourist. A man ran across the track as Ferrari's Nigel Mansell was about to cross the line to win the 1989 Brazilian Grand Prix, prompting BBC commentator Murray Walker to exclaim: "What a fool running across the course - a raving lunatic"